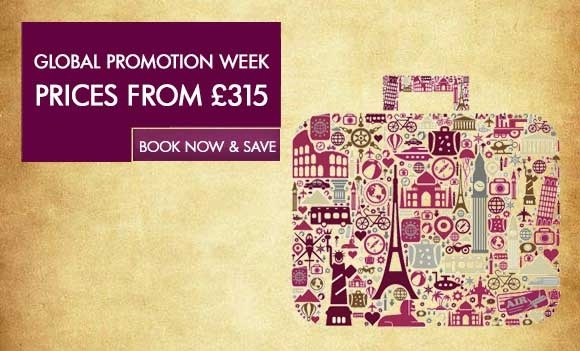 Qatar has been running special deals all week as part of their ‘Global Promotion Week’. Out of the UK, they are offering Dubai for just £320 in economy (£315 from Manchester and Edinburgh) amongst other offers. Business class prices start at £1,665 to Dubai, although deals such as £1,800 to Singapore are better value on a ‘£ per mile’ basis. Remember that you earn British Airways tier points and Avios points when you fly with Qatar. These deals are only bookable until Monday and you must travel before 15th June 2015. The link to book is here. Did you know you can give your Award Miles balance a big boost towards that next award by visiting our Buy Miles section and buying extra Award Miles today? It’s quick, easy and best of all you will receive a bonus of 25%. And if you purchase 40,000 Award Miles or more you will even receive a bonus of 50%! So make sure you buy before 31st December 2014 to take advantage of this exclusive bonus. This offer is the best we have seen all year for anyone who wants to buy a large number of Flying Blue miles – 50% is very good by their standards. The company has also raised the annual purchase limit to 74,000 miles (excluding the bonus) until the end of the year. The maximum number you can buy via this promotion is therefore 74,000 plus a bonus of 37,000, giving a total of 111,000 for €1,850. Is that a good deal? Well, Flying Blue is not exactly well regarded amongst European frequent flyer programmes. However it does have regular ’50% discount’ sales on some routes. At the end of the day, I don’t imagine anyone except an existing Flying Blue member topping up an account getting excited by this. It is also worth remembering that Flying Blue is an American Express Membership Rewards partner if you need a few thousand extra miles. The ‘buy miles’ page is here, scroll down to the Flying Blue logo. The bonus will not show until you log in. Just checked some of the routes, seems there is no availability on Chicago any more in Jan, neither Bogota. If you ever wanted to get to Tahiti Flying Blue have it in their promo awards so works out at something like 60000 miles and under £400 in tax compared to a ticket which costs £1350. Availability was also very good. It does close tomorrow though! I spent about 15 minutes there … the staff on the stands looked exhausted, and didn’t attempt to engage me … I left with just one brochure ! Luckily I live closeby, so I didn’t waste too much time. Just a suggestion…. Any chance that once a week/month a “share and learn” thread could be opened and anything left in comments that you think is worth a wider audience gets copied up into the post? Easy for us to say since we are not the ones with the admin of the blog! Thanks. This is a semi-secret closed door membership community where the Tesco forum is particularly good at identifying points deals. We need more of that here as points = Avios. The people who run it are inclined to be a bit neurotic/ illogical and ban members at a moment’s notice for ‘nothing’ other than (say) being an inactive non-posting member, so it is as well to get a couple of memberships running under different email addresses. You need to sign up, activate membership request then wait for the moderator to approve you as a member, which takes a few days. But then you’ll get pretty much all the Tesco codes, discounts, bonus clubcard points deals etc. Which you can share here or on FT.
Not a bad suggestion. Similarly, to develop a theme, not a bad idea to join up with Flyertalk thread on Tesco http://www.flyertalk.com/forum/british-airways-executive-club/1537357-tesco-ba-2014-master-thread-125.html, I believe the Webmaster here (Raffles?) runs it as admin. If it is Tesco related it will find its way here unless the offer is pretty useless (ie the recent ’25 points for a bag of salad’ did not justify a HFP post). I am doing the LeapFrog tablets tomorrow though. PTS is good for Nectar, Boots and similar stuff which I never touch. Also good for discussion about non-Avios / Virgin Clubcard redemption tips. I hate to disagree, there are a multitude of better ways to achieve a large scale AFKLM balance for less. And as a further observation, their yq fees are disgraceful. Sorry if I worded that badly, I meant it was the best ‘buy miles’ offer all year. Definitely not a great deal in its own right as you say. Shop Small sign up link is there on my Gold Card when logged in. There must be another way in?